Have an idea to fund raise for our cause? Host a Third Party Event and see your donation dollars at work within our community. Up to 75 percent of the Affiliate’s net income goes toward funding grants to local hospitals and community organizations that provide breast health education and breast cancer screening and treatment programs for medically underserved women. The remaining net income (a minimum of 25 percent) supports the national Komen Grants Program, which funds groundbreaking breast cancer research, meritorious awards and educational and scientific programs around the world. To get started, please review our Third Party Events Guidelines. Next complete the Third Party Events Agreement & Third Party Events Proposal and return to us via fax 901-757-8372 or email. For questions regarding Third Party Events, please contact our Communications Manager, Allie Lindsey, at 901-757-8686 or alindsey@komenmemphis.org. One way to educate your friends, family and community on the importance of early detection of breast cancer is by hosting a Rally for the Cure event. 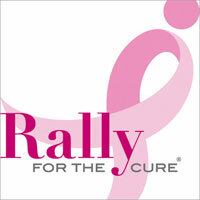 Rally provides all the materials including a prize, participant favors, event decorations and important breast health information. 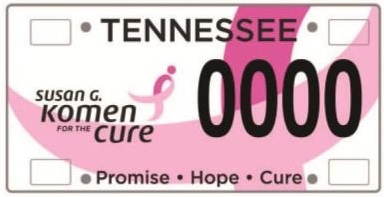 This plate is available to Tennessee residents who are registering a private passenger motor vehicle. The annual fee is $56.50 and $15.62 of the additional $35 collected is allocated to the Tennessee affiliates of the Susan G. Komen Foundation to be exclusively to provide grants to Tennessee organizations that were grantees of the Susan G. Komen Foundation before April 30, 2007, and continue to be grantees of the Susan G. Komen Foundation. The plate can be personalized with 5 characters available for a total cost of $91.50.